At Beaver Bar Camp X, I gave a talk on the theory of poker and hold’em strategy. The slides were intended to skim the iceberg of a professional poker player’s mindset. Though I’ll skim over what I talked about here. I first started playing online poker seriously on Pokerstars sometime during my freshman year of college. Attracted by those endless promotions poker rooms have, my first deposit into Pokerstars was $20. I read books, dove into forums, did the math, paid for coaching videos, studied the game as if it were for my computer science degree. I began to beat the microstakes (2NL 6max) at a hot rate of 20 big blinds per 100 hands over several tens of thousands of hands. I played 4 tables at a time, and played at least 4 hours a day. I moved onto 5NL on Full Tilt where I kept beating the game, then went through a long downswing, though still up. I tried my hand at a bit of heads-up; it wasn’t my thing. The US Department of Justice eventually seized Poker Stars and Full Tilt on what was deemed “Black Friday”. That was the end of that. We’ll jump right into Sklansky’s famous fundamental theorem of poker. That makes sense. If we could see all of our opponent’s cards, we would play perfectly and win. We can derive a mathematical expression for this by saying that the more we deviate from playing as if we could see all of the cards, the less benefit we gain. We can represent this most simply as Expected Value. Expected value (EV) is basically how much you gain or lose on average on a decision in the long run. Say we flip a coin where I get $1 if it’s Heads and you get $2 if it’s Tails. My EV is -$.50 and your’s would be +$.50. Sure it’s possible for me to get lucky and get a few tosses in my favor, but in the long run it’s a good deal for you as you stand to gain positive EV, average $.50 per flip. Now let’s translate this into poker. Say we both go all-in with me holding 27-offsuit and you holding AA. It’s possible for me to get lucky and win the hand, but it doesn’t mean you made the wrong decision. I have an 11% chance of winning and my EV is -$1.22. It would clearly be a profitable scenario for you, regardless of the outcome. Making +EV decisions over a long enough period means a gain. This is the fundamental idea of winning poker in the long run. Not mind-reading, not psychology, not picking up tells. With this established, I go into some concepts based on EV. I made these hands up to best represent the concepts and present tougher decisions. Hey, I even spent a long time doing the math, crunching numbers. 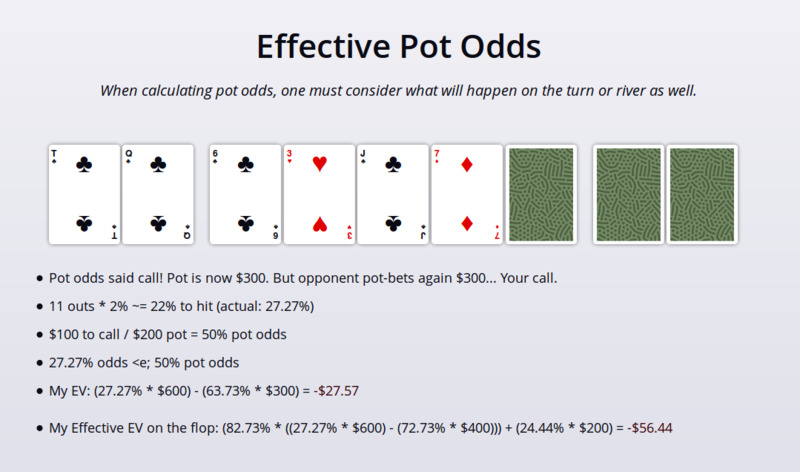 These concepts include pot odds, effective pot odds, implied odds, reverse implied odds, semibluffs, and fold equity. Most often, one can apply pot odds to see whether they stand to gain on calling a bet or raise, though they can apply to all decisions. I won’t go into them on detail, but the main idea of all of these concepts is to present situations where one could actually calculate the EV of their possible actions to make an informed poker decision in practice. I highly recommend taking a gander over these slides as they explain themselves pretty well. After I got some theory out of the went, I explained very basic hold’em strategy. I went through what it means to play solid tight-aggressive (TAG) poker including hand selection, positional awareness, general postflop play tips. Then I went through some hand reading examples. When playing at a table, it’s important to identify the types of players at the table as well as playing a solid playing style yourself. A good way to categorize players online with the help of a poker heads-up-display (HUD) is by their stats. Three stats that make it really easy to determine a player’s style are Voluntary Put-in Pot % (VPIP), Preflop Raise % (PFR), and 3-bet % (3B). VPIP is the percentage of hands they choose to play, PFR is the percentage of hands they raise preflop (rather than simply call and limp), and 3B is the percentage of hands they reraise. A weak-tight player tends to have a very low VPIP, and a non-existent PFR. They play very few hands (less than 10%), are not very aggressive, and fold easily. A loose-passive player has a high VPIP (more than 28%), and also a small PFR. They play a lot of hands and aren’t very aggressive with them. Rather than bet and raise, they will call with marginal hands or even nothing. A tight-aggressive player has a low, but focused VPIP (13-18%) and a large PFR (usually around the same as their VPIP). They choose +EV hands to play and play them aggressively. They don’t limp preflop and usually always open the pot with a raise. This is an extremely solid style of poker and most poker players that play for living employ either this style or loose-aggressive. A loose-aggressive player is pretty much the same as a tight-aggressive player, but plays a bit more hands (20-26%). Position is power. No, seriously. You have more EV playing hands in-position than out-of-position. Good position is being in the seat that acts later in the hand. The best positions are the button and cut-off (person in front of the butter), and the worst positions are the small blind, big blind, and under-the-gun (first to act preflop). Why you get more EV playing in-position is because you know what your opponents choose to do before you have to act. You thus have more information than your opponents in the hand. With poker being a game of incomplete information, information is key. For this reason, you should be extremely tight out-of-position, but you can loosen up your hand selection in-position. I included a rough hand selection chart weighted by position in the slides. I go on to talk about post-flop play, poker mindset (which I also recommend skimming), and tools and resources. Really, I could write forever and ever about the intracacies of poker and really hope the poker legislation in the US loosens up in the future. It’s really a different game than what Casino Royale 007 and what ESPN portrays. Having been a long spectator of these three games, I can honestly say poker is a game similar to that of chess and Starcraft. And like all other games, it’s more fun when you’re winning. So perhaps at your next poker party, the words of David Sklansky will reverberate in your head as you ponder that tough river call.